Listen up ladies! If you’ve been told you have low AMH (Anti-Mullerian Hormone) levels and diminished ovarian reserve, you may want to ask to have your vitamin D levels tested as well. New research finds that low levels of vitamin D influence AMH test results. In fact, if you have low vitamin D, you could end up with a false positive for low AMH! A 2012 study published in Journal of Clinical Endocrinology and Metabolism reveals that pre-menopausal women’s AMH levels change in correlation to the seasonal changes of vitamin D levels within the body. How Common is a Vitamin D Deficiency? Studies show that as many as 50% of adults and children worldwide are deficient in vitamin D! The body is usually able to synthesize its own vitamin D through sunlight exposure on the skin. However, people who stay indoors most of the time or who have darker skin pigmentation have trouble getting enough vitamin D. Darker skin does not absorb UV rays as efficiently as lighter skin. In fact, African American women are 10 times more likely to have vitamin D deficiency than Caucasian women! How Do I know if I have a Vitamin D deficiency? Vitamin D is a fat-soluble nutrient with hormone-like activity. Signs/symptoms of vitamin D deficiency can also accompany many other health issues, yet if you frequently experience any of the following (listed below) and have ruled out other factors, consider having your vitamin D levels tested. A simple blood test from your doctor can reveal what your levels are and if you need support. I have Low Vitamin D. What Are My Next Steps? 1. Supplements: Supplements are the best choice for people who need to avoid excess sun exposure because of cancer risk, people living in cold or dark environments, and for people with darker skin pigmentation, like African Americans, Native Americans or Latinos. Supplementing with Vitamin D is easy, affordable and can positively affect your fertility in many ways. It’s important to supplement with Vitamin D3, not D2. D3 is absorbed more efficiently than vitamin D2. To support fertility, a good daily dosage of vitamin D3 (cholecalciferol) is 2000 IU. 2. Diet: You can also obtain more vitamin D by eating eggs, fatty fish, organic dairy foods, or by taking Cod Liver Oil. All of these foods are excellent sources of vitamin D that your body can use to promote fertility health. 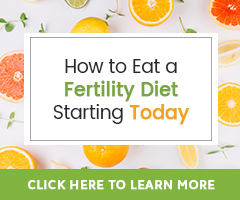 Follow the Fertility Diet to make sure your dietary vitamin D intake is high. 3. Sunlight: If you absorb vitamin D well, try some sensible sun exposure! Break away from the indoors, and spend just 15-20 minutes in the mid-morning sun every day to help shore up your vitamin D levels. If you’ve tested low in AMH levels and suspect you have a vitamin D deficiency, take measures to increase your intake. A follow-up AMH test may yield a different result once a vitamin D deficiency is corrected. However, if your vitamin D levels are normal and you still test low for AMH, take heart. AMH levels are just one fertility test, and we’re only learning about what low AMH levels really mean for fertility. One test does not show the entire state of your fertility health and there are many other natural steps that women with low AMH levels can take to enhance their fertility. Although i come from a state which is hot and sunny my Vit.D is very low. Thank you for this article. I’m hoping the Vitamin D supplements I am now taking will help my AHM levels.